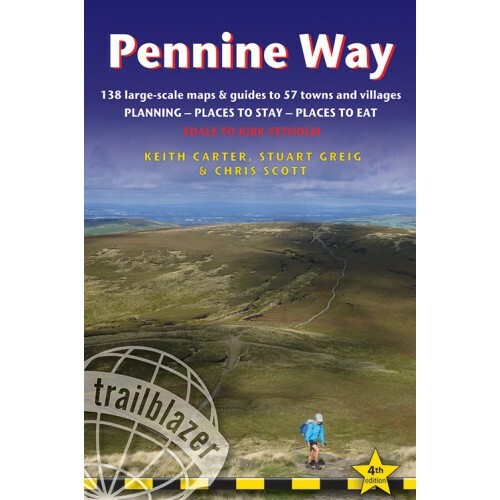 The Pennine Way, Britain’s best-known National Trail, winds for 253* miles (407.5 km) over wild moorland and through quiet dales following the backbone of northern England. Crossing three national parks – the Peak District, Yorkshire Dales and Northumberland – this superb footpath showcases Britain’s finest upland scenery, while touching the literary landscape of the Brontë family and Roman history along Hadrian’s Wall. This fully updated and rewalked 4th edition includes accommodation, pubs and restaurants in detailed guides to 57 towns and villages. Includes 138 detailed walking maps: the largest-scale maps available, at just under 1:20,000, are bigger than even the most detailed walking maps currently available in the shops. Unique mapping features – walking times, directions, tricky junctions, places to stay, places to eat, points of interest. These are not general-purpose maps but fully edited maps drawn by walkers for walkers. Itineraries for all walkers – whether hiking the entire route or sampling highlights on day walks or short breaks. Practical information for all budgets – what to see, where to eat (cafés, pubs and restaurants); where to stay (B&Bs, hotels, bunkhouses, bothies, hostels & campsites).